Electric cranes are materials movement tools that are powered by electricity. All cranes that are not operated manually involve the use of electricity at some point during their operation. The extent to which an industrial crane uses electricity determines whether or not it qualifies as an electric crane. Very large industrial shipyard cranes, which are used to load sea containers that weigh several tons, require electricity in order for the complex of servos, pulleys and hoist systems to move parts from one place to another. The generation source of this electricity is often one or more very powerful generators. They can be diesel powered or they can draw their source from another fuel. Because they generate electricity as a result of burning fuel, these cranes are generally not considered to be electric cranes. The words “electric crane” usually refer to smaller, lower load-capacity cranes that are used in manufacturing processes and in comparatively light-duty construction operations. Electric cranes can be designed in many configurations, but they are usually called upon when the power and scale of a large, gas powered or hydraulic crane is not necessary or is too expensive. Jib cranes, bridge cranes, stacker cranes and many other crane configurations can all be powered by electricity. The main factor that distinguishes these kinds of cranes from other, much larger gas powered cranes is that they don’t include their own power sources. They can usually be connected to a power source within a building or to the power sources of vehicles, on which they can often be mounted. In manufacturing processes, small jib cranes are often used in workstations for the movement of heavy parts over short distances. Automotive repair shops often make use of electric jib cranes when removing or mounting an engine. They can also be mounted in truck beds for use in small-scale hauling applications. Mobile cranes of these varieties are generally inexpensive, effective, safe and easy to use. 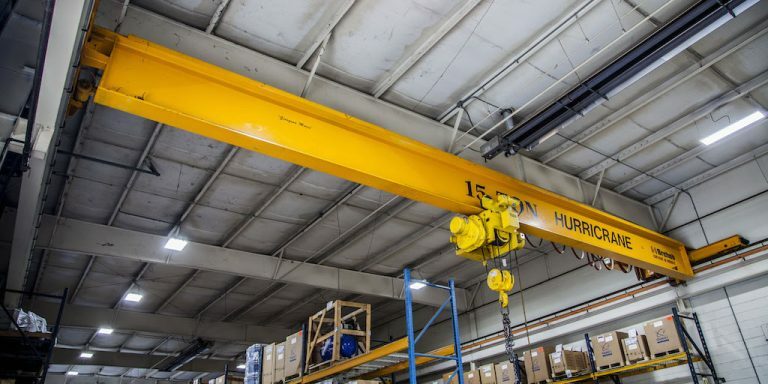 The largest electric cranes are usually bridge cranes used in warehouses and manufacturing operations; these cranes can reach across entire warehouse floors and require less operating space compared to other materials handling equipment like forklifts. They can also be connected to permanent electric power sources and don’t require their own independent power sources. The smallest electric industrial cranes can be battery operated. They are usually rechargeable and can be used in mobile applications or in very light-duty factory or warehouse lifting contexts. Electric Cranes Electric cranes are materials movement tools that are powered by electricity. All cranes that are not operated manually involve the use of electricity at some point during their operation.